Yes, friends. I went there. I wanted to make something unique for this time of year. Something spectacular, if you will. So I turned to the most trusted dessert source I could think of: the French. They love these things called “croquembouche” over there. Essentially, filled cream puffs, dipped in caramel and tacked onto a cone to make the whole thing look like a tower. I, honestly, just really loved the name…and the fact that I would be making cream puffs with a sweet and silky ricotta filling. How could this not be delicious? Sure, it would be tasty, but why build a tower?. What’s the need for this? What’s the point of going out to an arts supply store and buying a styrofoam cone, just so you can use toothpicks to stick cream puffs onto it? The point, I soon found out, is that you will be a holiday hero for making this! First of all, to be clear, they’re not just cream puffs. 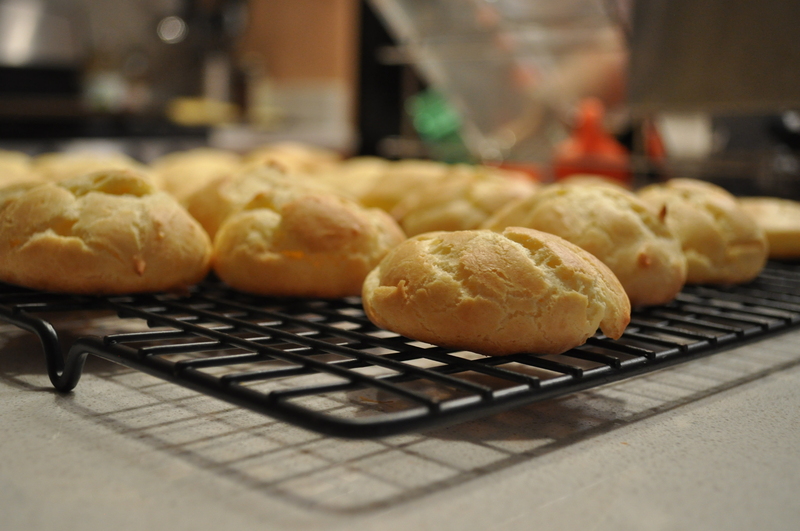 They’re cream puffs covered in caramel. Like a ring-spun halo of caramel. Which increases its value ten fold. Second of all, it’s on a cone, people! You end up with this cream-puffy looking tree with caramel dripping and oozing all over it. It really does look kind of spectacular. Are you as excited as I am?! Just to be sure that I wasn’t truly insane with my awe of this French wonder (though, would anyone care if I was? 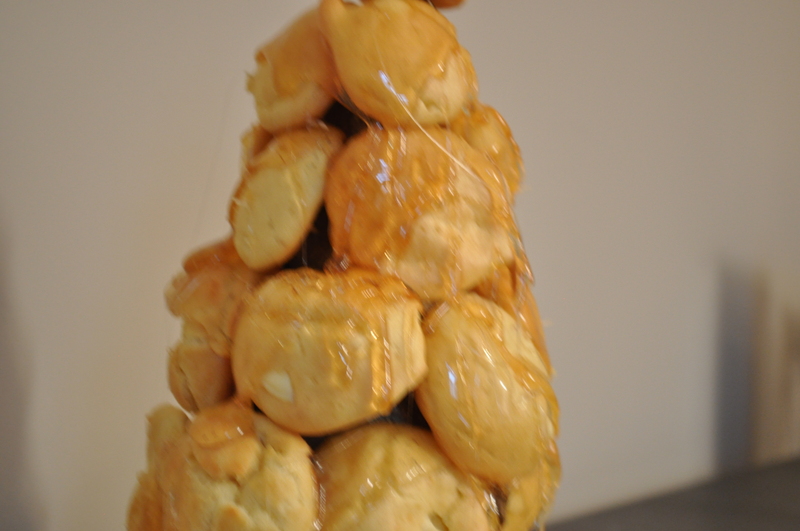 ), I also put out the extra cream puffs that were too big to put on the tree at a recent gathering. They were the same thing, just not stuck onto the cone. 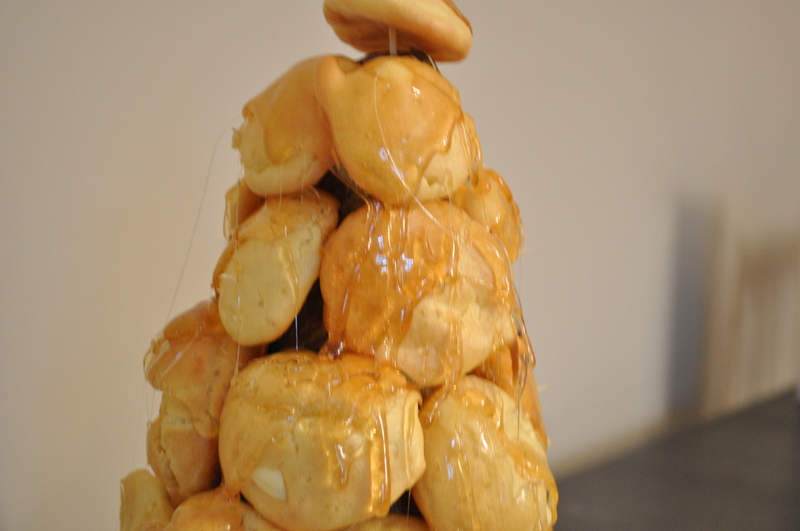 Sure, people liked the ones on the plate, but they gravitated towards the croquembouche. “I want to try that,” they would say, even though they would be chomping on the plated cream puff at that very moment. Sheer fascination with the cream puff tree. And who can blame them?! It’s a brilliant idea! The French really do know what they are talking about. 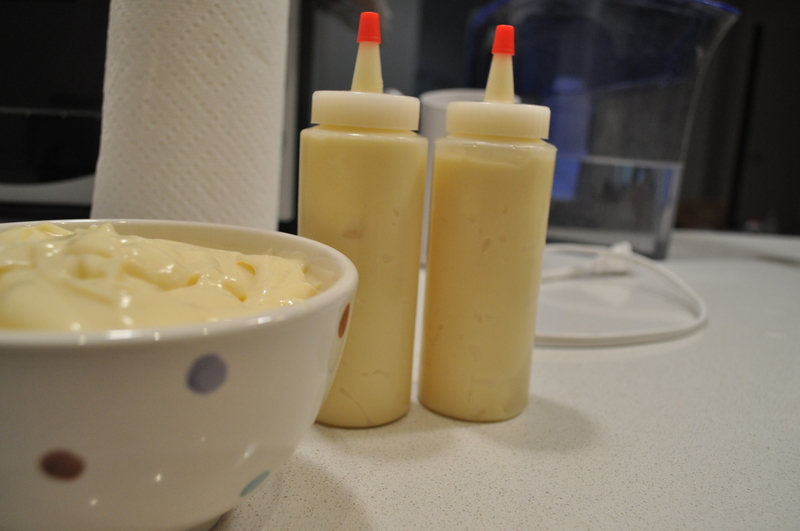 Because there are many many components to this dessert, and because I did not change a single thing from the original recipe, and perhaps because I’m slightly lazy, I’m linking it here. Also, here is a step by step guide on how to assemble this fabulous fabulous dessert. I don’t make candy. I just can’t handle it. It’s intimidating. You need thermometers and huge oven mitts and to know terms like, “soft ball stage.” And then, to top things off, the candy needs to look pretty at the end. Inviting, even. Talk about pressure. It’s really not for me. Do I even need to say it? Of course I tried to make candy! With the holidays just around the corner, I just figured that some homemade chocolates around the house would be nice to share. 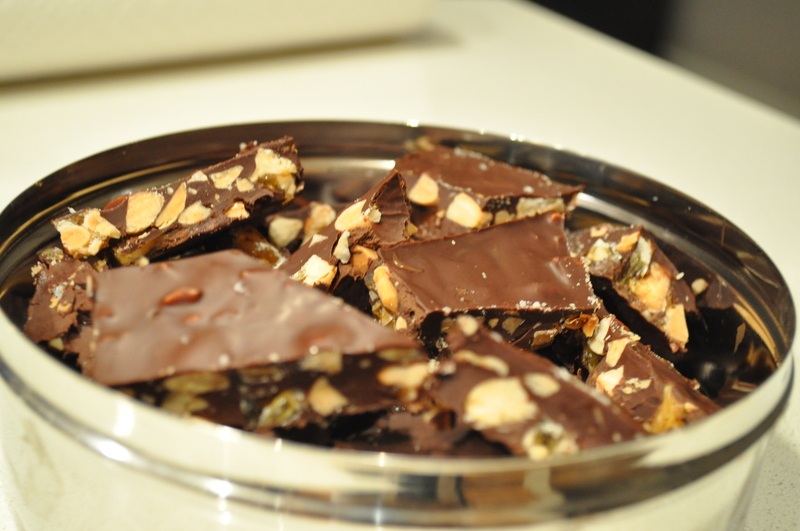 So I picked the most no-brainer recipe I could think of: chocolate bark. This isn’t really supposed to be that hard. 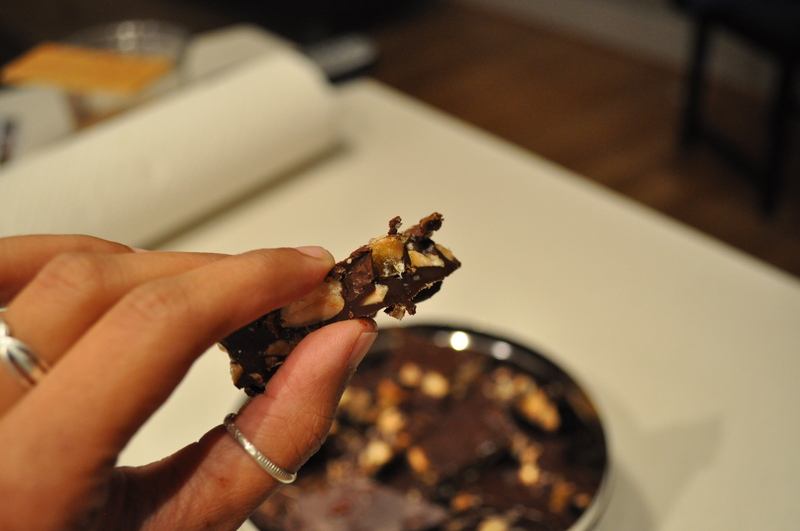 Mix melted chocolates with nuts or crushed mints or dried fruit, and ta da! You have homemade chocolate bark! I prepared myself for what I thought would be an easy candy making experience: I chopped the nuts, prepared my chocolate for the melting process, and lined my pan with foil. Then. I finally read the recipe. This wasn’t a normal bark recipe. It was a bark with homemade almond brittle! As in…homemade candy. What. Was this really necessary?! Of course it was necessary! Who wouldn’t want a smooth chocolate with a crunchy, salty almond brittle to break it up. What a tasty little (impressive) treat that would be! The lucky part for me (and for all of you homebakers-that-do-not-make-any-kind-of-candy-at-all), this recipe did not have temperatures to follow, or “stages” to watch out for. The only instruction was to cook the sugar and water until it reached a shade of “dark amber”. Colors! Awesome – totally doable. So I followed the color directions and suddenly had almond brittle! And then I mixed it with the melted chocolate (what I was set out to do in the first place! ), and I had the best tasting chocolate bark…ever. It was like two candies in one! Double the success! A few words that are not intended to scare you off from making this: You don’t have a lot of time! You might think you do, but, really, you don’t. Don’t step away when making the caramel for the brittle. It looks all pale and sad for the longest time, and then bam! It’s dark amber in no time. It will fool you. And then, the trickiest part of all: the spreading of the brittle in order for it to cool. Really, to be honest, the brittle does not at all need to be spread to be brittle-like. It crystallizes instantly. And then it will become impossible to spread. 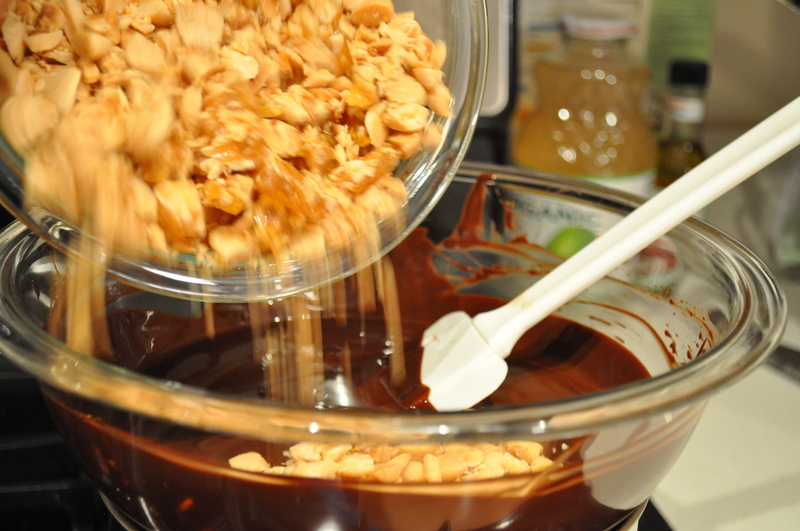 Be as speedy as possible and try to get the brittle as thin as you can, which, as it turns out, will make the chopping of the brittle a lot easier…which will make the the mixing with the melted chocolate a smoother process. It all comes full circle at the end. Which is when you get to enjoy delicious homemade candy! The recipe says that after breaking the brittle to eventually put in the chocolate, you should filter out the smaller pieces and the “dust” that falls from cutting the brittle, because it will make the bark too sweet overall. Although I thought that this was an unnecessary step, I did follow it, and was glad that I did. First of all, the bark was just the right amount of sweet at the end. And second of all, more importantly, the ensuing leftover “dust” would be an incredibly delightful and welcome addition to any ice cream or yogurt, I would imagine. 1. Line a baking sheet with foil. Place the sugar and water in a 2 quart heavy saucepan. Swirl (do not stir!) to moisten the sugar. Heat on high until the mixture starts boiling, stirring occasionally. Keep boiling until the mixture turns a dark amber color. 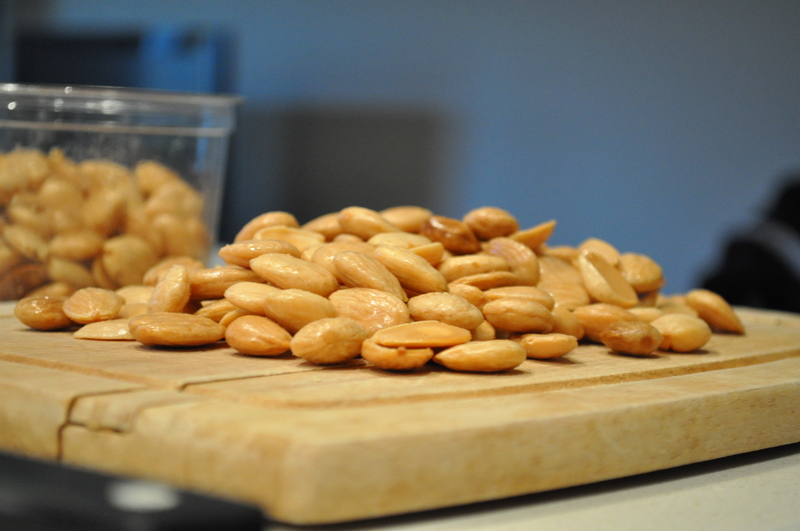 Turn off the heat and mix in half of the almonds. 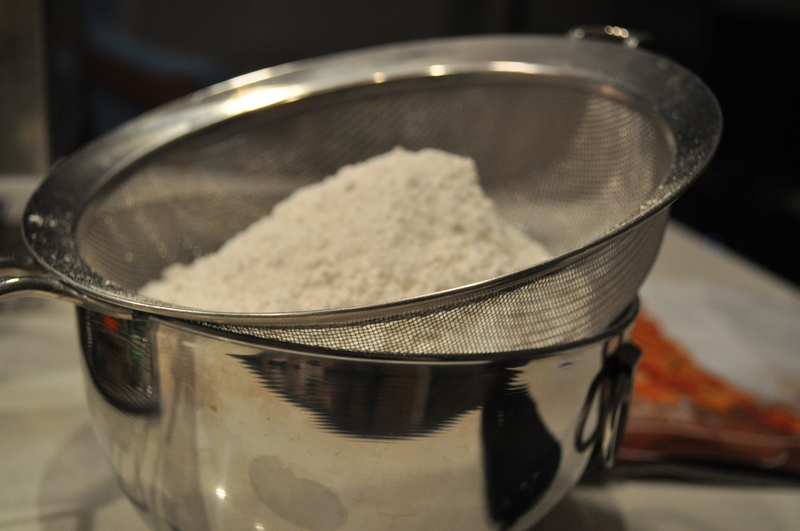 Quickly spread the mixture on to the baking sheet to 1/8 inch thickness. Cool completely, to room temperature. This mixture will be quite hot for some time. Break or chop into bite size pieces, saving only the pieces, and filtering out the sugar dust. Put aside. 2. Heat about 2 inches of water in a saucepan. 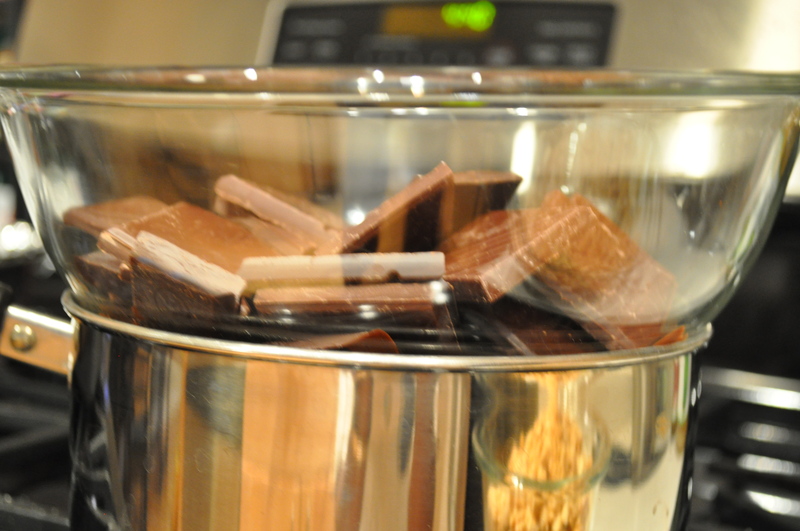 Chop chocolate and place in a glass bowl that is bigger than the saucepan, in order to create a double boiler. As the water simmers, place the bowl on top of the saucepan, stirring occasionally until the chocolate is melted. Be sure that none of the water gets into the bowl with the chocolate. 3. 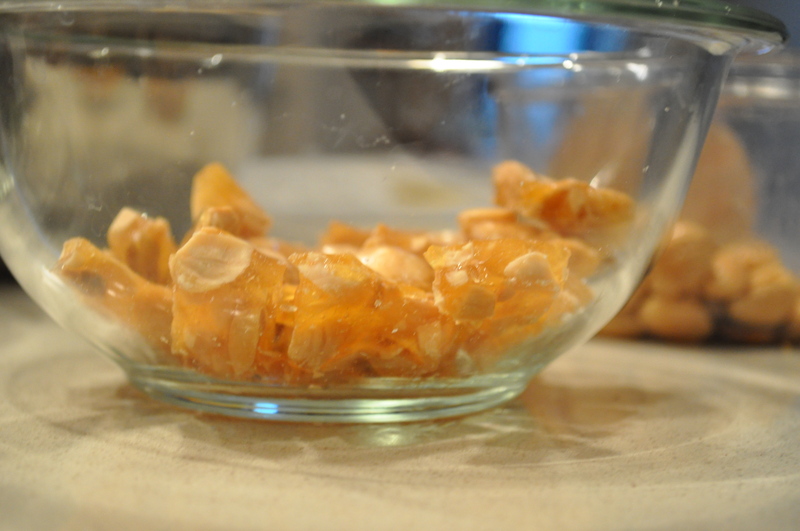 Turn off heat and mix in reserved almonds and almond brittle. 4. Line a 9×13 pan with foil. Pour chocolate mixture into prepared pan, making sure that the chocolate covers all the almond pieces. Shake the pan to level the chocolate and place the refrigerator. Cool for 45-60 minutes. Take out to break into pieces, and then place back into refrigerator until ready to serve. When I was younger, one of my favorite outings would be to go out for breakfast. There was always something so special about it. Weekday breakfasts were always quick, and usual, and just something to get us out the door before a whole day of school. But when we went out for breakfast on a Saturday morning, I knew that I would have the lesiures of the weekend ahead. Ironically, my favorite place to go out for breakfast was McDonalds. Talk about a long, leisure-filled breakfast. I mean, don’t get me wrong – I absolutely loved the fancy hotel buffet brunches with the soft served ice cream. But McDonalds is what I would get excited about. For one reason, and one reason only: the cheese danish. You understand. Does McDonalds even sell these gems anymore? From what I recall, they were perfection. A flaky pie crust filled with a usually, off-center dollop of sweetened cream cheese, all drizzled with a candy-sweet glaze. It was absolutely amazing in my young eyes, a breakfast for champions. I am happy to report that my tastes have matured since then. But my love for cheese danishes is still just as strong. So when I discovered a similar pastry during my recent trip to Puerto Rico, I was ecstatic. Instead of pie crust, these pastries were flakier. Instead of the blob, er I mean, dollop, of cheesecake-like center, these pastries were filled with cream cheese, barely kissed with a touch of sweetness. 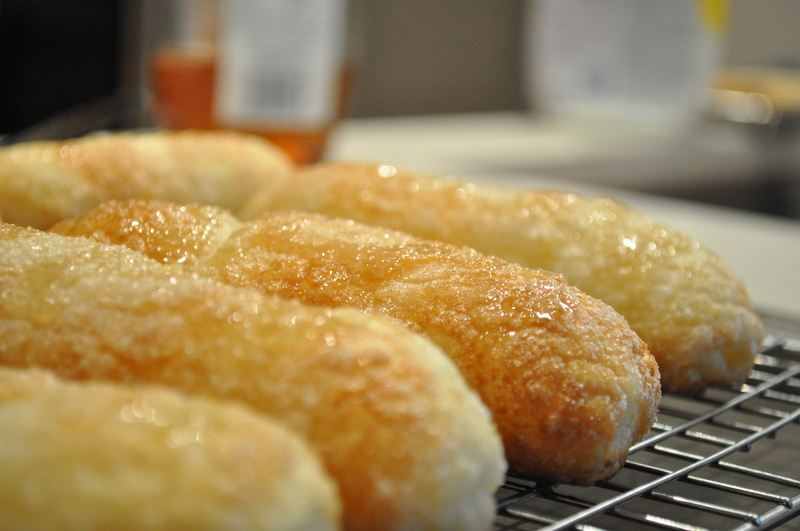 Instead of the glaze, these were rolled in sugar, sparkling, and baked to a deep golden brown. Instead of being flat and round, these pastries were long and cigar-like, kind of like it actually was older and more mature than any other cheese danish that I had before. 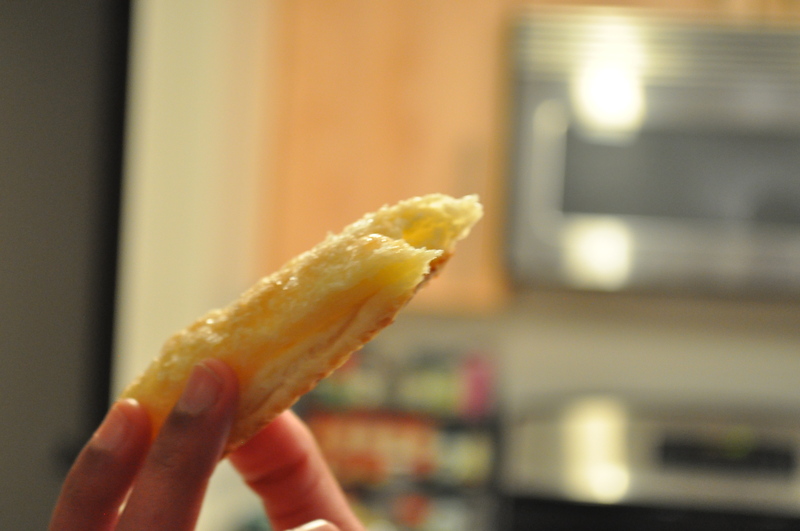 It was like the cheese danish of my dreams – only, it was sooo sooo much better. It was, I’ll even say, the highlight of my trip – breakfast wins people over like that. 1. Combine the cream cheese and powdered sugar in a small bowl. 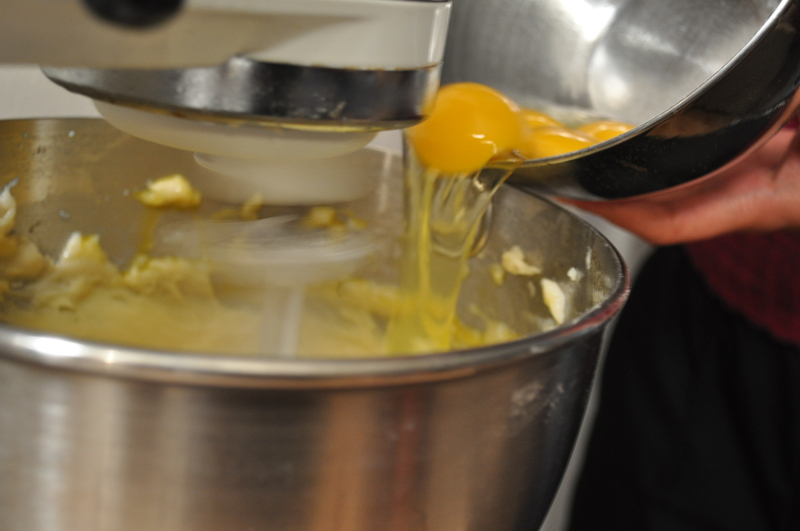 Mix until the sugar is well incorporated into the cream cheese. Place into the fridge until ready for use. 2. Preheat oven to 400 degrees. Line a baking sheet with parchment paper. 3. 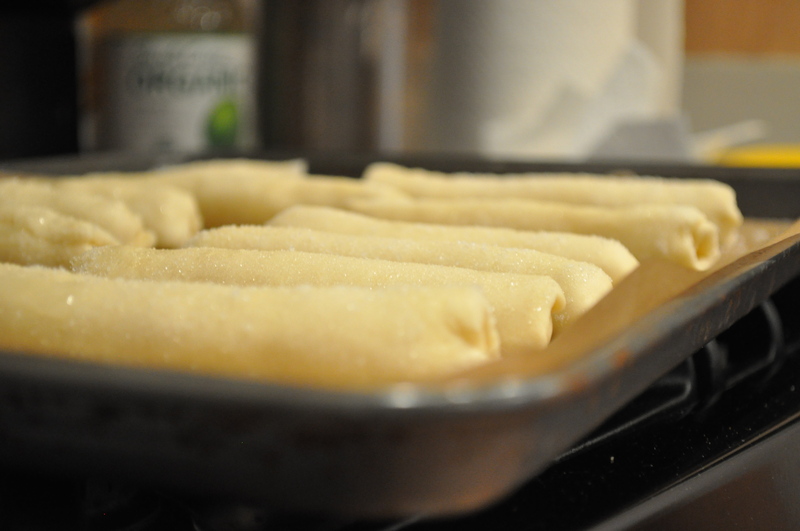 Roll out thawed puff pastry on a floured surface until it is a 12 x 12 square. Divide the puff pastry into 12 equal squares. Prick each piece with several fork marks. 4. 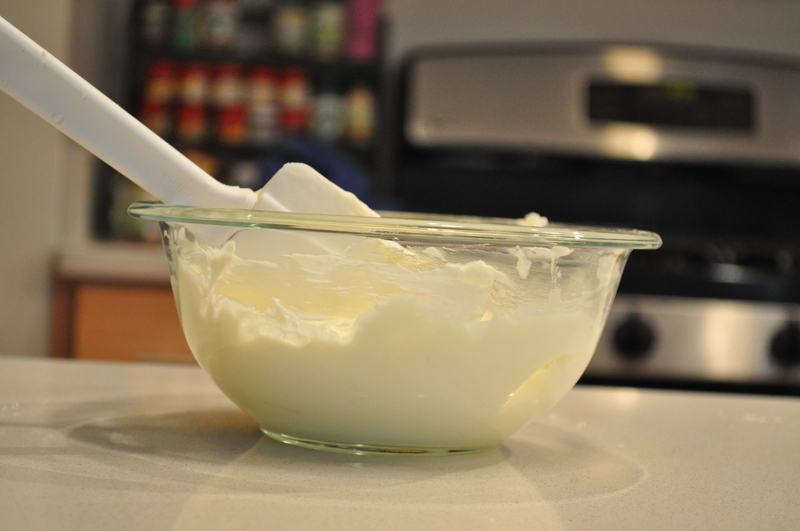 Take the cream cheese mixture out of the fridge. Spread 1 tablespoon measure along one edge of one square, leaving about a quarter inch of space on both sides. 5. 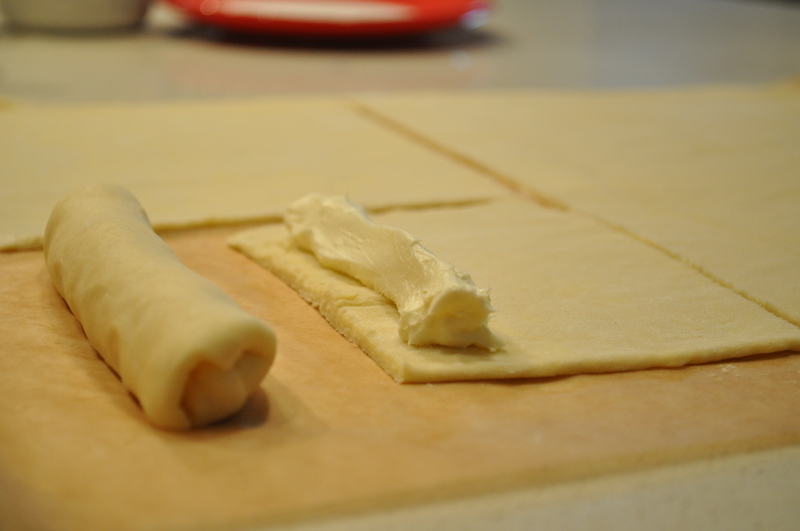 Fold over edges, and then roll the puff pastry until the cream cheese mixture is completely enclosed. Press edges to seal. Repeat with remaining 11 squares. 6. Place pastries, seal side down, onto the baking sheet. 7. Brush each pastry with the egg white. 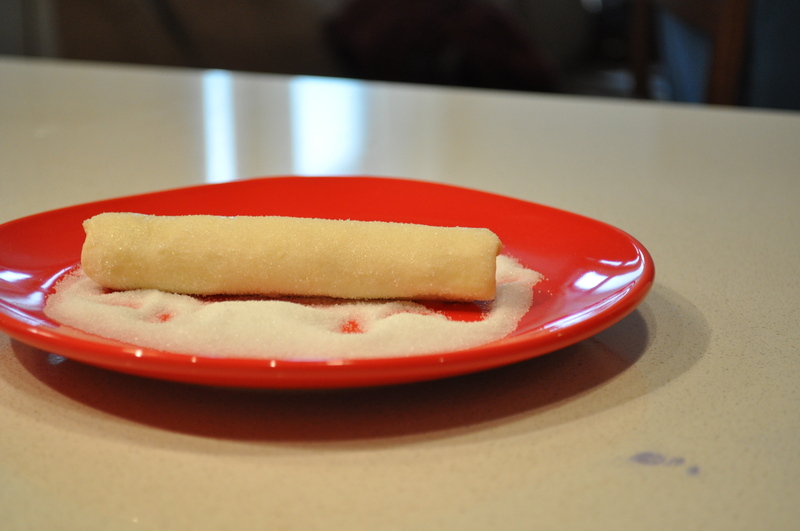 Sprinkle the top of each pastry with granulated sugar. 8. Bake for about 15 minutes, until golden brown. 9. 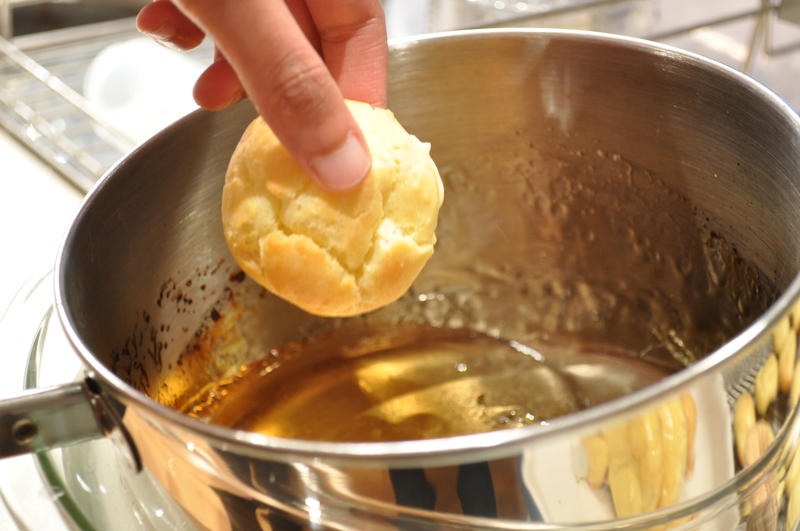 Immediately move the pastries to a wire rack and brush with warmed honey to make the pastries glisten.